I always love having the opportunity to try out a range of products from a brand that is new to me, and today that brand is Skinfood. 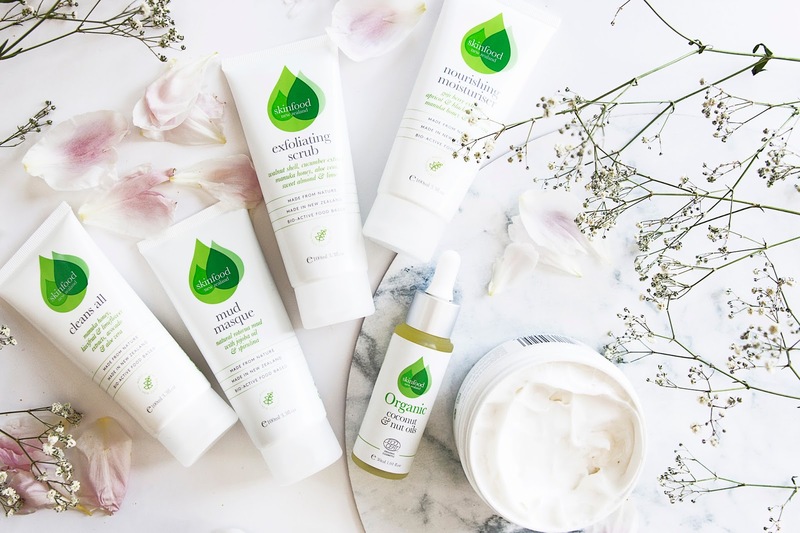 The New Zealand based brand uses natural food based ingredients to create nourishing, cleansing and revitalising skincare. As well as being free from any nasties, they make sure that every step in their product creation process is as sustainable as possible, with all their ingredients being sustainably sourced, using recyclable packaging, and not testing on animals. This is the perfect day time moisturiser, It's lightweight, super smooth and sinks easily into the skin. It also has a orange citrus scent which I really like. This moisturiser is full of awesome ingredients such as goji berry extract, apricot and blackcurrant oils, manuka honey and aloe vera, which gives your skin and injection of vitamins A and E to help hydrate, protect and repair it. We all know how I fair with face oils, so I just did a test on the back of my hand with this one. I found to be quite oily, probably one of the more oiler products I've come across, and it had a mild, but pleasant, coconut scent. This stuff is suppose to be great for those with sensitive skin and you don't just have to use it on your face, but on your hands body, or even your hair. I feel like a product like this would be great to use at night, so your skin can really soak up all the benefits as you sleep. This oil contains organic coconut oil, which is amazing for helping repair hair and skin, sweet almond which helps maintain the pH levels in your skin, macadamia nut which helps fight against ageing, and apricot kernel which helps to soothe your skin and give it a boost of Vitamin E.
I love a good face mask, and this one certainly didn't disappoint. I found it super smooth to apply and it was really easy to get a nice full coverage on your face. It also had a mild natural scent to it. This mask contains a bunch of natural minerals from the volcanic muds in New Zealand, and this masks helps to give your face a good detox, while also softening the skin. I love a good exfoliating scrub to make sure I really get off any excess makeup and dirt from the day, and I've been loving this one. It terms of harshness, I'd say this exfoliant sits in the middle of the spectrum; it really feels like its working, but it's not so harsh that I feel you could use this everyday, depending on your skin type. This scrub contains walnut shell, which are part of the particles you can actually see in the cream which act as an exfoliant to remove dead skin and help it look glowy and fresh, cucumber extract, which helps repair your skin as well as soothe and cool it, and lime oil, which helps reijunvite your skin and protect it against infections. This is another daily facial cleanser which will help to remove dirt and build up on your skin, morning and night. This is a creamy cleanser which doesn't foam up a whole lot when using it, which is something that normally puts me off a cleanser, but I still found my face felt clean and fresh after using this stuff. Last, but certainly not least, is their body butter, and I love this stuff. The scent is amazing, it has a sweet mango scent that I could sniff all day. While it's a little bit thicker, which I find makes it perfect for use at night, it still rubs and sinks into the skin really easily and leaves my skin feeling so soft, but not sticky. I normally don't get that excited over body butters but this stuff is really the best. That mud mask sounds so awesome. I definitely need to check it out.